London Bubble Co. is one of the coolest waffle cafes in town, and it scores high on desserts and funky ambience done in pink and white tints. 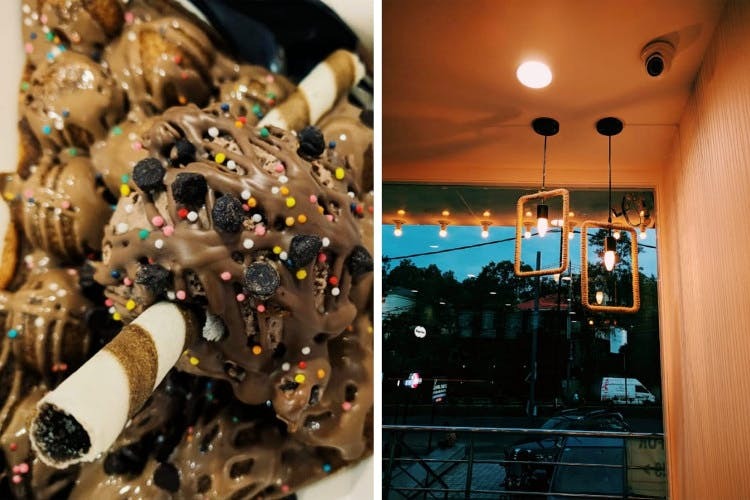 Located right next to Häagen-Dazs in Jubilee Hills, London Bubble Co. is a waffle cafe that whips different kinds of waffles like the pocket and exotic waffles, bubble waffle wraps and Wafflewiches. Defined by simple lights, quirky framed posters, it's a cute space and ideal for Insta-stories. We tried a wide range of desserts here that include Bubblegum, Nutella but what we really loved are the Ferrero Rocher variants. While the Ferrero Rocher gelato is for those days when you're looking for a simple dessert, the Ferrero Rocher Rush is what can send you into a true chocolate frenzy. Plus, it has the gelato too in it. What else can you ask for? The bubble teas are bleh and we wish they could improve them. The parking facility is largely disorganised.